The US Navy wants to go all in on the USS Ford-class aircraft carrier program. Less than a year after the first-in-class ship’s commissioning (before it ever launched or recovered an aircraft…a first in history), the sea service is exploring options to buy them in bulk. The Navy has already repeated several common acquisition mistakes with the Ford program, but this latest scheme would pile on more problems. The Navy committed to this program—which includes several new major ship systems like nuclear reactors, catapults, and radar systems—while their designs were still in a conceptual stage, and the inevitable complications in their development have contributed greatly to the program’s $6 billion cost increase. Committing to such a large program with so many unproven systems earned the Ford-class program a spot on Senator John McCain’s (R-AZ) “America’s Most Wasted Report.” Yet, James Geurts, the Navy’s Assistant Secretary for Research, Development, and Acquisition, said before the House Armed Services Committee on March 6 that the Navy is studying a potential two-ship block buy for the third- and fourth-in-class ships. Geurts testified that such a plan could save $2.5 billion over the total cost of the program, although this is only a rough estimate at this point as they are asking for evidence of savings from the contractor rather than seeking an independent cost estimate. The history of this program should make everyone skeptical of such claims. The Government Accountability Office released a report in 2017 that stated cost estimates for the Ford program are unreliable because they do not take into account the risks associated with building the ships before the design has been completed and tested. The ship’s electric advanced arresting gear is supposed to be able to go 16,500 landings between mission failures. So far, the best it can do is 19. The Ford program is intended to create replacements for the current Nimitz-class supercarriers. The older carriers rely heavily on steam-powered systems to launch and recover aircraft. The Ford-class design incorporates the Navy’s new all-electric ships concept, in which most of the major components on a vessel are powered by electricity rather than steam or hydraulics. All of the Ford’s major systems use electricity rather than steam for power. The Navy has had to completely redesign those major systems—which includes the aircraft catapults and arresting systems—and they have so far demonstrated poor reliability in testing. DOT&E concludes that the current catapult design stands only a 9 percent chance of completing a 4-day combat-tempo operation without a critical failure. The ship’s electric advanced arresting gear is supposed to be able to go 16,500 landings between mission failures. So far, the best it can do is 19. The problems with these systems are bad enough that President Trump, in slightly more colorful language, has called for the Navy to return to steam-powered systems. Navy leaders have made at least one step in the right direction with the program recently. Following pressure from several key lawmakers, Navy Secretary Richard Spencer announced that the USS Ford will undergo crucial full-ship shock trials in 2019 or 2020. Shock trials occur when explosives are detonated underwater in close proximity to a fully kitted-out and crewed ship. This is done to test the integrity of all the ship’s systems to determine if they are sufficiently hardened to withstand the rigors of combat. Shock trials are supposed to be done as early as possible in a shipbuilding program so design problems can be identified and fixes incorporated into the design before more ships are constructed. This helps avoid costly retrofits on already constructed ships. In 2017, the Project On Government Oversight called on Congress to demand the Navy carry out these tests. This latest announcement reverses an earlier Navy decision to postpone shock trials to the second-in-class ship of the Ford program, which would have delayed these tests for up to six years, by which time construction on three of the ships would have been substantially completed. The Navy and the Pentagon’s testing director both agreed in 2007 to perform this important test to the first-in-class ship. But on February 2, 2015, the Navy abruptly informed DOT&E that they would not conduct shock trials on the Ford, citing concerns the tests would delay the ship’s first operational deployment. Senators John McCain (R-AZ) and Jack Reed (D-RI), the Chair and Ranking Member, respectively, of the Senate Armed Services Committee, have been rather vocal about their wishes to see the shock trials performed on the USS Ford. Other Members of Congress, however, have been working to do the Navy’s bidding by inserting language in the 2018 National Defense Authorization Act that would have allowed them to postpone the tests. As with the F-35 program, block-buy plans for the Ford program skirt the margins of legality. The Pentagon can commit to multiple-year acquisition contracts, but only after certain criteria have been met. Title 10 U.S.C., Section 2306b stipulates that for a program to be eligible for multiyear procurement, the contract must promote national security, result in substantial savings, have little chance of being reduced, and have a stable design. Until any program completes the IOT&E process, it does not meet the criteria for a multiyear contract. Pentagon leaders know this, which is why they are careful to request block buys instead of multiyear contracts. Calling such a plan a block buy means the scheme is not subject to the same legal requirements. This is little more than verbal jiu-jitsu because the net effect is the same: the American people are stuck with the tab for an unproven weapon that may never live up to the lavish promises used to sell it, leaving the troops with a system that could fail them at the very moment they need it the most. It should also be noted that that there are plenty of people in Congress who are complicit in this plan. More than 100 lawmakers recently sent a letter to the Secretary of Defense pushing for the two-carrier deal. 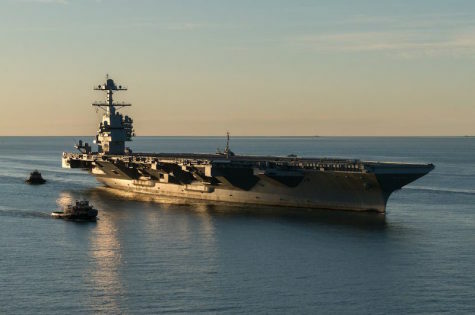 While the announcement that the Navy will conduct shock trials on the USS Ford is a positive step, this program has a lot more to prove before lawmakers should commit more taxpayer dollars. No decision for any kind of a multiyear purchase should be made until after all operational tests are performed and the results are properly evaluated and reported. Any potential savings from a multiyear deal now could easily be erased paying for expensive retrofits should significant design flaws be found during the remaining tests.